$3.00 Admission on May 12th 8am-7pm. ALL other days are FREE admission! This sale is OPEN to the PUBLIC!! May 12th-18th, 2019. Go to Eventbrite.com to get your free admission ticket. Bring your biggest shopping bags and your BFF to this shopping extravaganza! 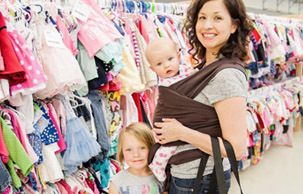 You'll find aisles and aisles of the best of gently-loved and new items at great savings. We perfer cash but also accept Visa and Mastercard for payment. Thursday, May 16th 25% off DAY! 10:00am-5:00pm FREE admission! 25% off items WITHOUT a star for ALL shoppers! Friday, May 17th HALF PRICE DAY! 10:00am-7:00pm FREE admission! 50% off items WITHOUT a star for ALL shoppers! Saturday, May 18th Half Price Day! 8:00am-3:00pm FREE admission! 50% off items WITHOUT a star for ALL Shoppers! See Consignor details page for more details. $6.00 per car for PARKING!!!! Sign up so you know when the next event is happening! "I love the chance to clear out our storage area with old baby stuff. I tell my 5-year old daughter that we are giving someone else the opportunity to have great things for their daughters, which she likes. It makes it easier for her to let go of them, too."